legendary gems of color. handmade Engagement rings to house them. If your ring must have color, you've come to the right place. Have your gem cut on the same wheels and signed by the same cutter who cut the world's most famous sapphire: The Rockefeller Sapphire. Let's Collaborate on your ring. 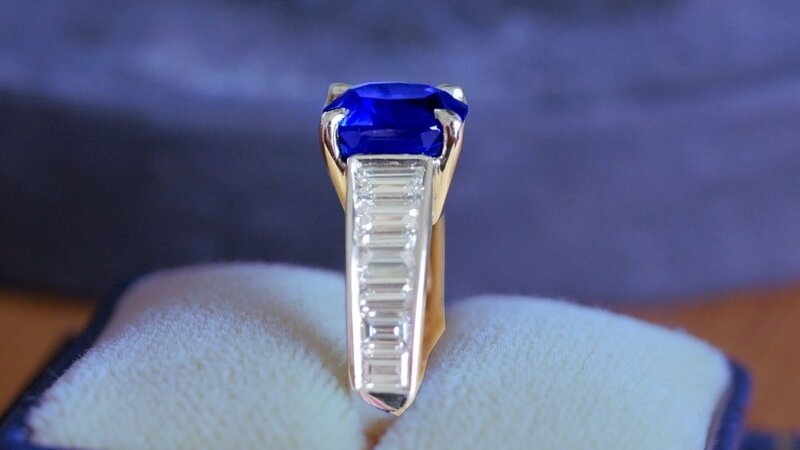 You can expect the same tireless devotion to the quality of your ring that the gems we cut demand. Beauty: every angle, any light. Wise gem shoppers start by purchasing the loose center gem. Everything else – ring design and additional gems – emanates from the centerpiece. Choose from a cutter and connoisseur's evolving selection of rare Sapphire, Ruby, Spinel, Tsavorite, Demantoid, Spessartite, Tourmaline, and other rare gems of color. With a deep history and long experience in gem selection and cutting, Cushion Gem is passionate about helping you capture your story and forge enduring memories. Discover the allure of colorful gemstones! Explore our rare collection of treasures.